Souring agents like pulp of Tamarind, Lemon Juice, Kokum, Citric acid, Vinegar, Tomatoes, some types of Cucumbers(like Dosa Kaya).etc. Sour Curds also adds taste and is nutritious. Sweeteners like, Jaggery, Sugar, Dates, Raisins etc can be added . This balances and blends all the tastes like salty, sour, spicy etc. Bitterness: Fenugreek seeds, fenugreek leaves, Neem flowers, Rind of lemons, etc but very little quantities for health. 4. Tempering : Tempering is known Tadka, Tarka, Chhaunk in Hindi, Bhagaar in Urdu and Poopu or Tallimpu or Tiragamotha in Telugu. This is the "SOUL OF ANDHRA CUISINE " and also to some extent in other Indian cuisines. This enhances the flavors and makes a dish tasty. It is important to get this right. Though this looks easy, one can only master this with experience. Adding or avoiding one or some of the ingredients will change the taste entirely. The oil used and ingredients used for tempering give the flavor which is unique to that cuisine. Well, usually while making chutneys, we need to prepare the tempering first, cool it and grind it before adding the other ingredients. There are also some recipes where you add the tempering in the end, that is no grinding of it is required. In some cases we have to use both. This is the Masala Box or Popula Pette which every kitchen in Andhra has one. I have more than one to store small quantities of various spices for easy use while cooking. In some recipes we may have to use coriander seeds. You can add garlic according to taste. For tempering, heat oil in a small pan to smoking point, reduce heat and add Chick peas fry for a minute or two. Add the Black gram mix and fry for a minute. Now add the Fenugreek and mustard seeds. After a minute or two the seeds start spluttering. Now add cumin, dried red chillies and Asafoetida, Turmeric and lastly curry leaves. Stir it to save from getting burned. Remove and keep aside. 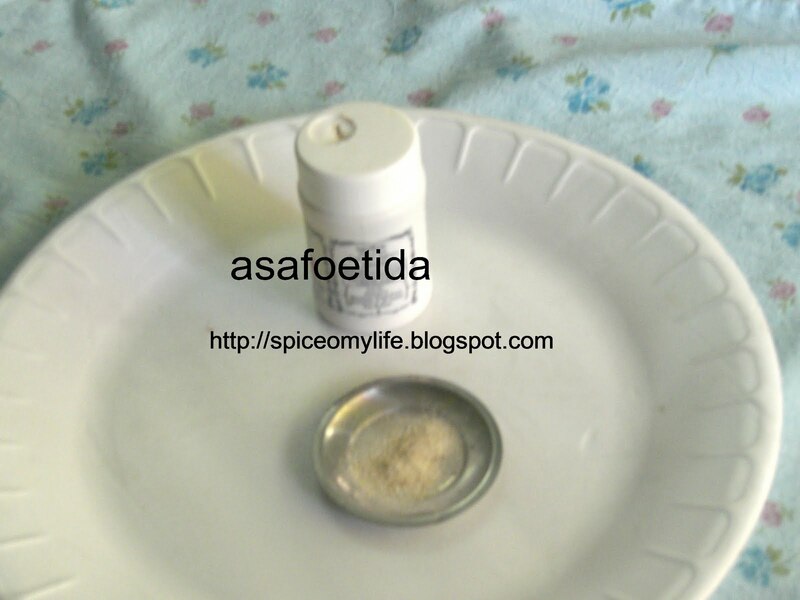 Asafoetida is available in powdered and slab forms. Powdered one is good for daily use and when we have to cook fast. Otherwise, the slab is good. Its actually raw and needs to be broken into pieces and fried in hot oil. and then grounded to powder as and when required. This is so good that a very less quantity as compared to the powder gives a good taste. For a healthy diet, quantity of oil can be reduced. 5. Garnishing: Chutneys are garnished with finely chopped Coriander greens and Curry leaves. Sometimes we can garnish them with fried green chillies or finely chopped onions etc depending upon the recipe. Small kadais (Deep frying Pans) made of steel, copper bottomed, even non stick ones are available for this. The one with a handle is quite convenient. 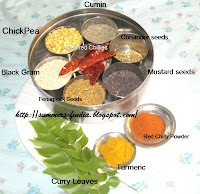 Please adjust the quantity of spices especially, chillies, pepper etc according to your taste. We in Andhra eat very spicy and hot food. When I say 4-5 chillies, just use one and see. Sometimes there is already some natural salty or sour taste in the ingredients being used. Depending upon that, the quantity of salt and souring agents should be adjusted. For example Onions are a bit salty. Cucumbers, tomatoes, curd, lemons etc are very sour. So we need not add any extra souring agent. Turmeric should be put in last and fried in oil while preparing the tempering. Most people dont like to eat it raw as it gives a bitter taste. But it gets easily burned in hot oil. There fore it must be added just before removing from the fire or even after it. Frying dried red chillies in oil while tempering reduced its spiciness and is easier on the stomach. The taste is different if roasted ones are used. Some of the chutneys are cooked well to remove the moisture content and also more oil is used. Such ones can be kept for more than a day or two. Other wise generally chutneys should only be consumed with in the day. One can keep them in the refrigerator for some more days. But fresh ones are best. So it is always better to make the required quantity only. One can use some of the vegetables with their peels. Some of the chutneys are made with left over peels alone there by avoiding wastage and are also nutrients. Always use fresh ingredients. Vegetables, fruits or leafy vegetables etc should be fresh and crispy. They should be cleaned thoroughly in water and then dried with a cloth and aired to remove any moisture content. This is very important for those which are kept for more than a day. Or else the chutney gets spoiled. If chutneys are cooked during preparation, it should be cooled well before covering with a lid. Or else it gets spoiled quickly. Always use the seasonally available ingredients as much as possible. For example during summer season we get raw mangoes. So Tamarind, Lemons etc can be substituted with mangoes.